The oldest masonry fort in the continental U.S. and a National Monument, the Castillo is the focal point of historical St. Augustine. The oldest masonry fort in the continental United States, the Castillo de San Marcos is a large Spanish stone fortress built to protect and defend Spain's claims in the New World. It's a National Monument and, at over 315 years old, it's the oldest structure in St. Augustine. It's also one of the main attractions visitors to St. Augustine come to see. There's plenty of things to do at the Castillo, from the numerous rooms that once housed soldiers and prisoners, to the large interior courtyard and gun deck which offers a great view of the city. Regular daily programs and ranger-led tours are free with admission, as are cannon firings and weaponry demonstrations, which are offered (weather and staffing permitting) on Fridays, Saturdays and Sundays at 10:30 a.m., 11:30 a.m., 1:30 p.m., 2:30 p.m. and 3:30 p.m. The Castillo is open every day of the year except Thanksgiving and Christmas Day. Passes to the Castillo may be purchased at the ticket booth on site (open from 8:45 a.m. to 4:45 p.m.) or online here. Special events and programs offered by the Castillo may have additional fees. 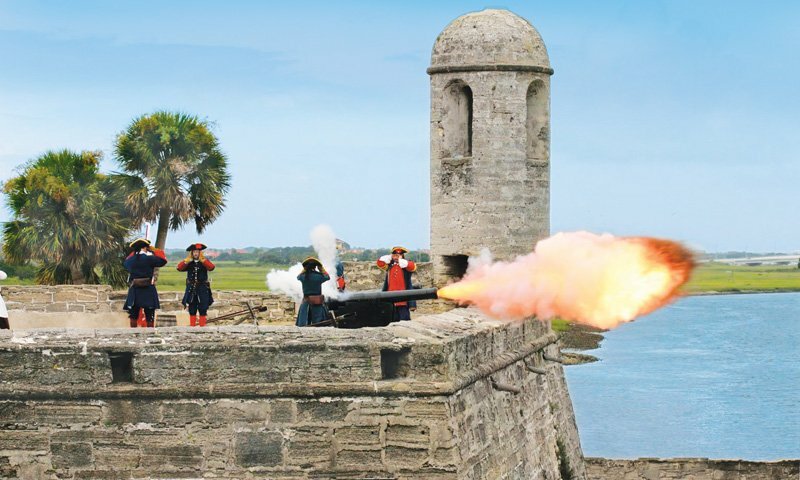 Active military who present their military "CAC" Card are eligible for a free annual pass to all National Park Service areas which includes the Castillo de San Marcos. 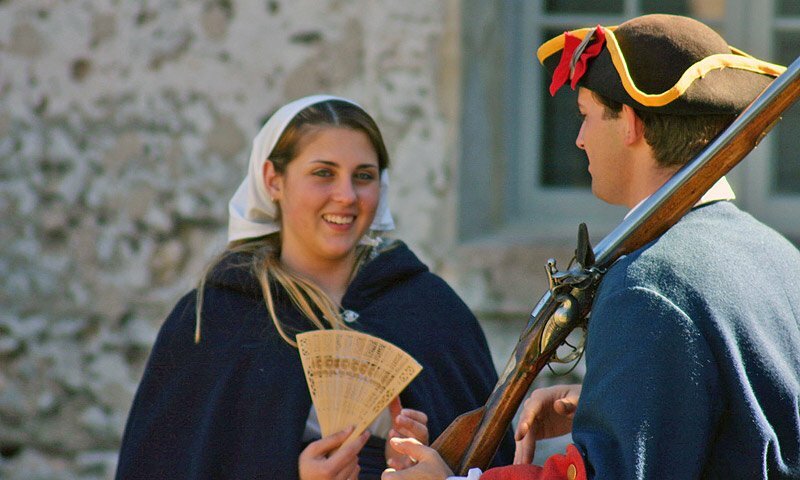 The card allows the military member and up to three other adult guests into the fort for free. Construction began on the Castillo de San Marcos in 1672 and lasted 23 years, until 1695. Many Spanish forts preceded the Castillo, however, this one made of coquina was impenetrable to enemy attack and was fire resistant. The fort came under fire for the first time in 1702. British forces, led by General Moore, burned the city but could not penetrate the Castillo's walls. Subsequent attacks in 1728 and 1740 yielded similar results, and the British were never able to take the city of St. Augustine by force. In 1763 however, Florida became a British colony with the signing of the Treaty of Paris, thus beginning a 20-year period of English rule. The Castillo was used as a military prison during the Revolutionary War, and at one time it held three signers of the Declaration of Independence within its walls. At the end of the Revolutionary War, Florida was returned to Spain in 1784 until Florida became a United States Territory in 1821. The Americans called the Castillo Fort Marion, honoring the revolutionary patriot from the Carolinas, General Frances Marion. The U.S. Government used Fort Marion as a prison for Native Americans in the late 1800s. Natives from both Florida and the Great Plains were held at the fort during this time. The fort was officially taken off the active list of fortifications in 1900 and it was preserved and recognized as a National Monument in 1924. 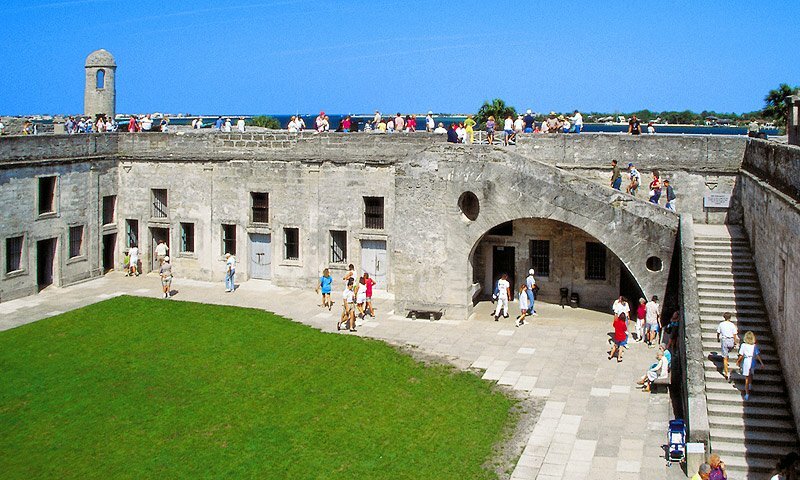 Congress renamed the fort in 1942, reverting to the Spanish name, the Castillo de San Marcos. 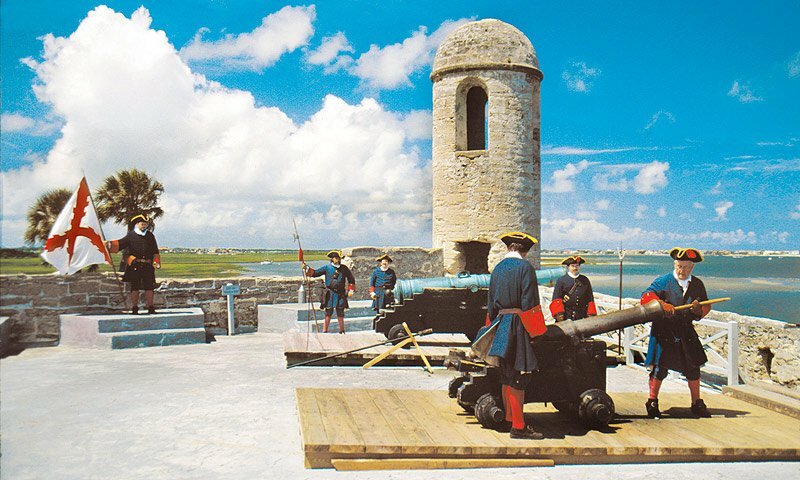 At over 315 years old, the fort is a lasting landmark of seventeenth-century St. Augustine. View our 3D Tour of the Castillo here. This was one of the coolest places i have ever been to. So much stuff to see and learn. This is a great place for anyone to come. Super amazing city too. Love everything about this place! I'm an old salt! Visited this fort in the 70. Had a great time wandering around and seeing what a period fort looks like in its preserved state. Such an awesome experience thinking or putting yourself back at the times of Pirates raiding and Spanish defending the Fort. As a sailor appreciating how much a defensive strategy had to be planned and maintaining supplies. The general logistics where workers were so busy. The stories told and true! Loved it ! A great memory! Thanks to St Augustine! A few years ago, I visited a Spanish fort in Portabello, Costa Rica that appeared to be similar to this one, but I was pleasantly surprised to find Castillo de San Marcos preserved much better and with far more to see. The view was breath taking and the rooms inside of the fort well maintained and documented. Enjoyed it! I fell in love with the Castillo de San Marcos when visiting July 4, 2013. Staff were firing the cannons and decked out in period attire. I took many pictures which are now hanging on my walls. I plan to marry there October 31, 2013. My husband used to play there when he was small and now we love to visit. I was on the fabrication team back in 1983 that manufactured those carriages. I was an Exihibit specialist with the NPService. Its nice to see pictures of them, They seem to be in good shape. Makes me happy. I, wouldnt overload those cannons though. I dont think they were designed to fire cannons from. Dont let anyone get crazy with the black powder. I,ll swing by sometime. It would be nice to have a closer look at my babies. don't know if the fort has hidden pictures in the walls,but my wife took a picture of our child behind a door in one of the rooms and a very clear face is in the picture with my little girl.enjoyed the visit but picture is a little creepy. I was glad to see that the fort was still in tact. It lets you feel the history behind it. They have not let it get commercialized and built all around it. It has been preserved well. I was disappointed in the rest of the city's history and what they have let it become. All tickets valid for 7 consecutive days. Children (15 and under) FREE if accompanied by an adult.